Summertime in Texas means 100 degrees days and finding any means necessary to keep cool. Swimming is, of course, at the top of everyone’s list. Aside from staying cool and out of the heat, swimming also has many therapeutic properties and we highly recommend swimming to a majority of our patients. We do caution our patients with high muscle tone with pools that have very cold water, as the cold water can cause muscles to increase in rigidity. There are several heated pools in and around Austin that would be best for patients who have high muscle tone. We were recently asked about swimming pools with wheelchair access either by a ramp or chair lift and are happy to share what we have learned with all of you! We started by asking the great folks at Free Fun in Austin to ask their readers for contributions to this list, to our surprise, most of the Austin pools were listed. After a call to the Austin Aquatics office, we learned that the City of Austin installed chair lifts at nearly every pool in Austin before the 2014 season began! We called and emailed surrounding areas to verify accessibility as well and have compiled this list. Initially, we were calling every pool individually and some of the locations we spoke with mentioned that their chair lifts were under repair, so we do advise that you call ahead to make sure the lift is available and functional. If we missed one, please let us know and we will update the list! This list of Austin pools is copied from the City of Austin Website. For a full list of pool features including whether or not the pool is heated, the City of Austin provides this great comparison chart. Entry fees vary from Free to $5. YMCA Austin – Verified with Program Manager that ALL Austin YMCA locations now have a wheelchair lift available. Georgetown Recreation Center – 1003 N Austin Ave, Georgetown 78626 – 512.930.3541 – Indoor pool. Wheelchair lift available. Rock ‘N River Family Aquatic Center – 3300 Palm Valley Blvd – PH: 512.671.2737 – Wheelchair lift available. 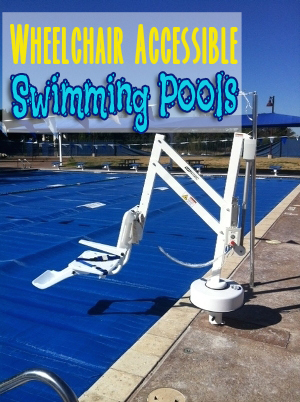 Tagged aquatic therapy, chair lift pools austin, chair lift pools georgetown, chair lift pools round rock, wheelchair accessible swimming pools, wheelchair lift pools austin. Bookmark the permalink.